Pre-sales for all shows end at noon on the day of the show. Tickets are will call only, nonrefundable, but transferable to another person (for the same show). All tickets are general admission. January 27, 2015 marked the 70th anniversary of the liberation of Auschwitz concentration camp. Dignitaries, heads of state, and survivors of the Holocaust attended to commemorate the event in Poland, while millions watched the live broadcast from around the world. Cantor and former Auschwitz prisoner David S. Wisnia, and his grandson, singer and songwriter Avi Wisnia, travelled back to Poland at the invitation of the Auschwitz Museum and the Polish government. Together, the Wisnias spent a week in Poland conducting programs, leading services and performing, starting in Warsaw and ending at the anniversary event in Auschwitz, where Cantor Wisnia sang – as he did many times when he was a prisoner in the camp - this time, as a liberator and survivor. David and Avi Wisnia recount their recent travels in Poland, with stories about the Holocaust and music that they will perform together. David S. Wisnia has a remarkable voice, and he uses it to tell his remarkable story. A native of Warsaw, Poland, he is a graduate of the Yavneh-Tarbut Hebrew School System. He received most of his vocal training in Warsaw, as a student of the famous director/composer Maestro A.Z. Davidovich. David was also personally tutored by renown Cantors Gershon Sirota and Moshe Koussevitsky, singing in their respective choirs as well as performing on stage and on Polish radio. Cantor Wisnia is a linguist, having mastered multiple languages: Polish, German, French, Slovak, English, and Hebrew (as well as Yiddish). He has performed internationally, leading services and giving concerts in Buenos Aires Libertad Synagogue (1975), Israel’s Yad Vashem (1983), and Warsaw’s Nozik Synagogue (1985 & 1986) where he officiated at the first formal “Bar Mitzvah ceremonial” to be held in Poland since World War II - this is the same synagogue where Wisnia sang as a choir boy over 70 years ago. He most recently appeared in concert with Maestro Leopold Kozlowski in “The Last Klezmer In Poland” in Krakow and Princeton, NJ, and he sang to commemorate the 70th Anniversary of the Liberation of Auschwitz at a 2015 event attended by both survivors and Heads of State, televised to an international audience of millions. Cantor Wisnia is a survivor of the notorious Auschwitz Annihilation Camp where he was incarcerated for close to 3 years, saving his life by singing to entertain the Nazi SS and cell block leaders. While in the camp, he composed two songs that became popular with the inmates. One song is in Polish, “Oswiecim” (Auschwitz) and the other in Yiddish, “Dos Vaise Haizele” (The Little White House In The Woods), now on display at the Holocaust Museum in Washington DC. David was transferred to Dachau in December 1944, surviving the Death March, and managing to escape. He was soon found and rescued by the American 101 Airborne Division. Joining with the 506th Parachute Infantry, he engaged actively in combat during the closing days of the war with Germany in 1945, becoming both a survivor and a liberator. David S. Wisnia continued singing in the United States. He served as Cantor of Temple Shalom in Levittown, PA for 28 years, and recently retired after 23 years as Cantor for Har Sinai Hebrew Congregation of Trenton, NJ. David is a member of the American Conference of Cantors within the Union of American Hebrew Congregations, and continues to be an active vocalist, educator, and congregational community leader. A memoir of David Wisnia's powerful life story is now available, in conjunction with Comteq Publishing and Stockton University. 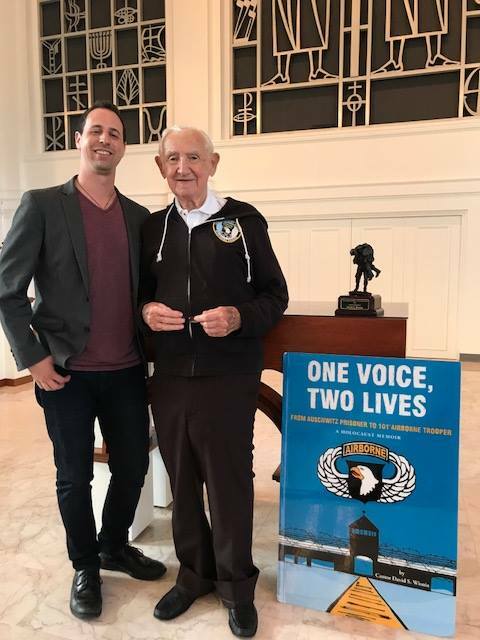 For information about this book, "One Voice, Two Lives: From Auschwitz Prisoner to 101st Airborne Trooper", please visit www.onevoicetwolives.com.